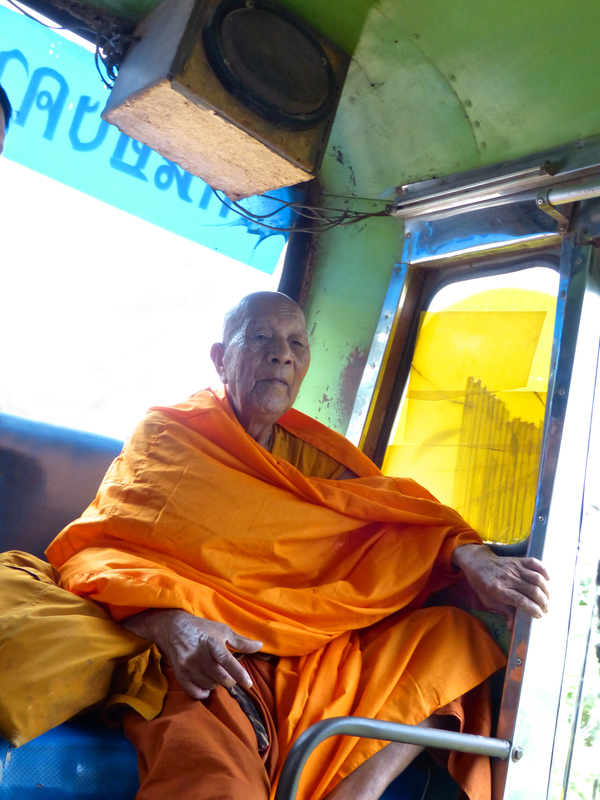 So much time in Bangkok left us longing for solitude and simplicity. After an initial blunder on the hotel selection we really found everything we needed in Tha Bo. I had selected a hotel in advance and given a call to the owner who explained the hotel was not really being used frequently. I was eager enough for solitude to accept an old funky hotel and the owner said he would give us a discount so now we had a destination. After an overnight train ride from Bangkok we arrived in Nong Khai a border town between Laos and Thailand. 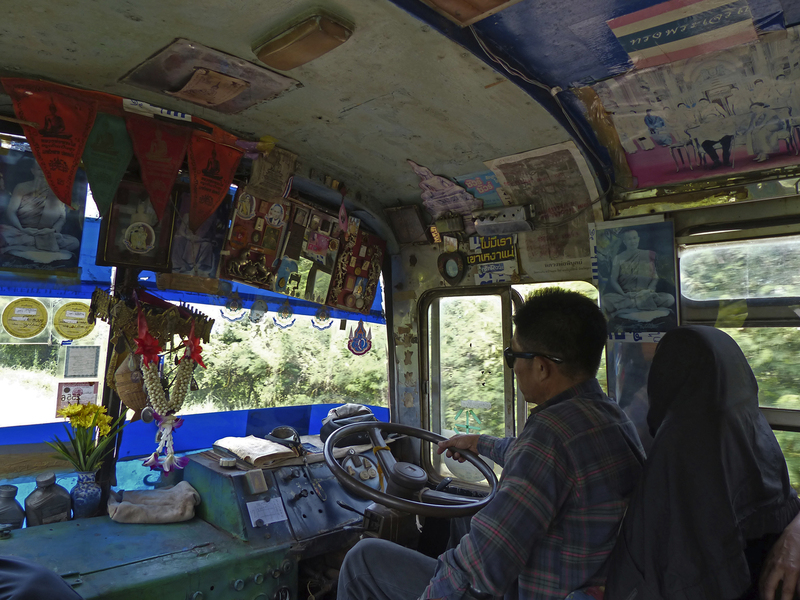 Instead of crossing the border we jumped on a local bus to the tiny town of Tha Bo. We met a lovely lady named Tuey waiting at the bus stop who fed us fruit and insisted on paying for our bus ride in order for us to avoid “tourist price”. She paid 20 baht each. 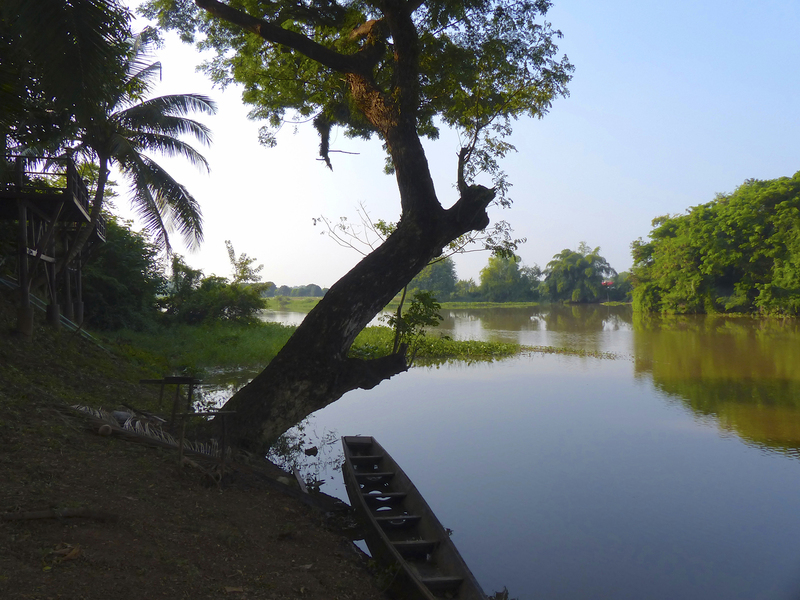 We rode along the Mekong for about an hour until we reached our little town of Tha Bo (Pop 16000). 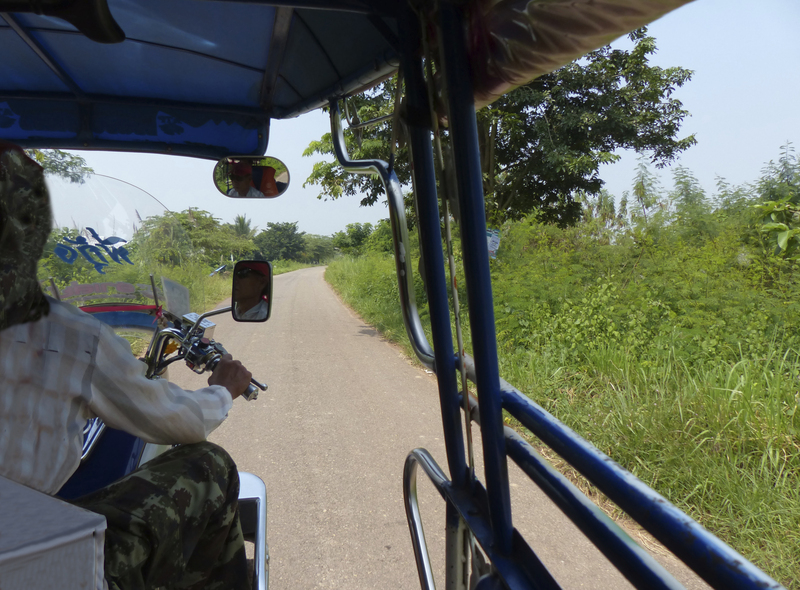 From there we found a tuk tuk driver who knew the way to our guest house. It was far from town but a pretty location. We arrived to find very dirty rooms and an obviously never used hotel. The caretaker was very sweet and attempted to make everything okay for us. We ended up sweeping out our own rooms and helping perform general cleanup. It seemed like it might all work until the rotten wooden floor in the reception area collapsed as I was crossing it. I fell through scratching myself a bit and having a closs encounter with a rusty nail (only got my shirt). At that point, Michel was pretty much done with making the best of it (me too really) and we headed out on bikes for ………? Since we had left Bangkok and arrived in Tha Bo no one we met but Tuey had spoken english. So all of the events that are described in this particular post occur without any real verbal communication. Michel and I can muster up a few words of Thai at this point but very few complete sentences. 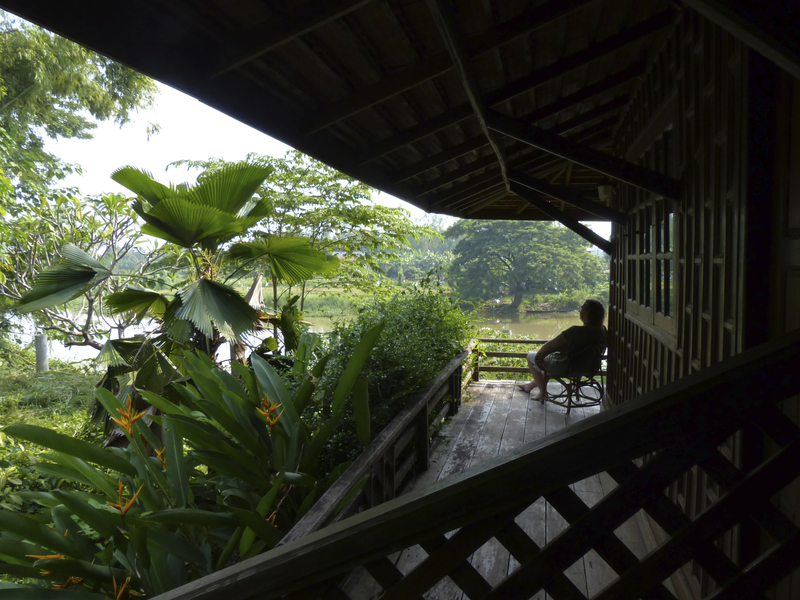 Michel saw a beautiful wooden balcony far in the distance as we rode over the small river near Tha Bo that spills into the Mekong. 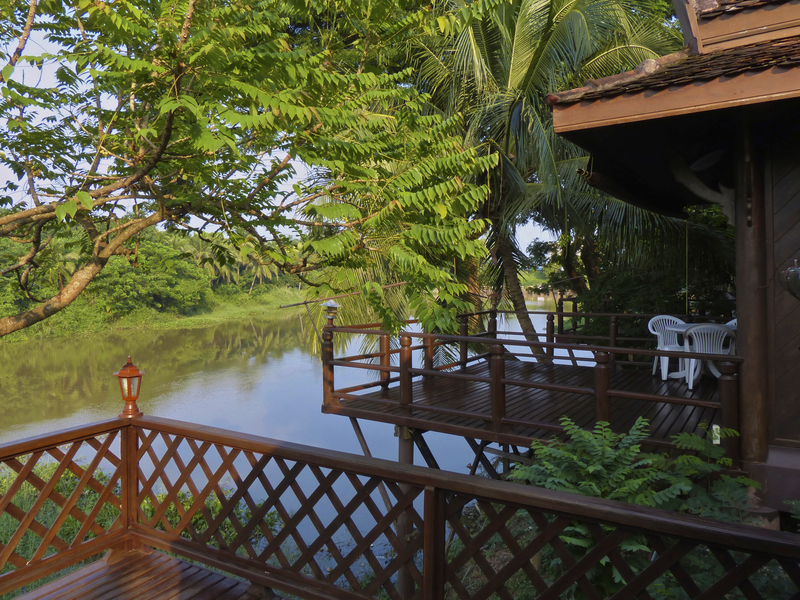 We pedalled over to it and discovered two small bungalows on the river. A nice lady at the hotel keyed the number 800 into her calculator (800 baht) and held it up so we could see it. We signed to the her that we would love to stay. And that is how Michel discovered our little paradise in Tha Bo. The ambience was perfect. We were the only farang (foreigners) in the whole town. The room was better than anything yet on our trip. Even came with little white robes and slippers. Every morning the little lady owner would come quietly onto our balcony and leave us delicious baguette, eggs, and coffee. We were well received everywhere we went in the town. At night time only a short walk away vendors would setup restaurants on the sidewalk. 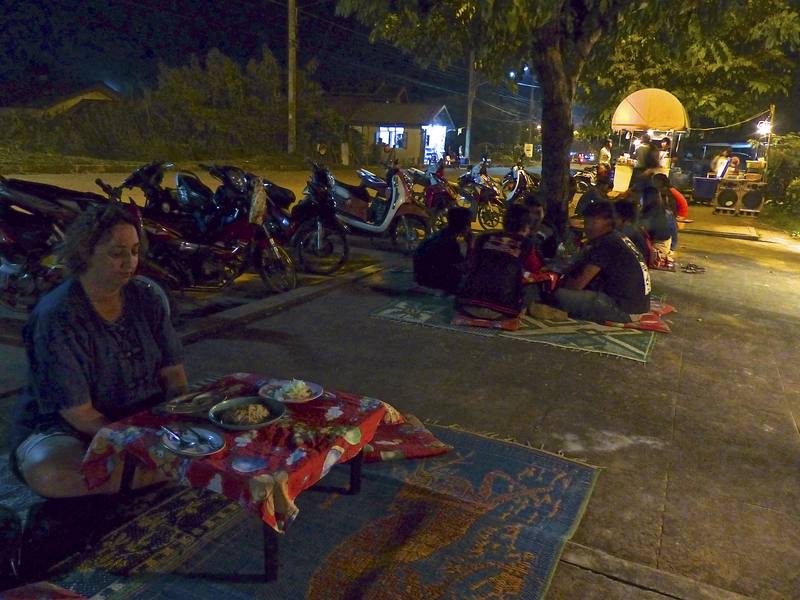 Restaurants meaning rugs on the sidewalk, small low tables, an outdoor kitchen. We ate delicous dinners at both restaurants. At the second we had a wonderful meal where again (like Bangkok) we were served raw food which we boiled in a spicy broth. 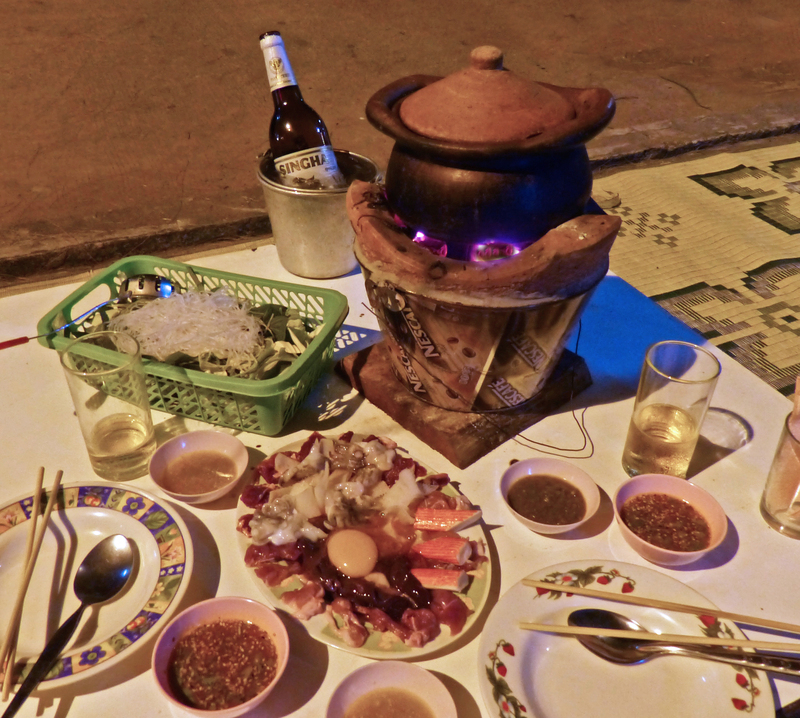 Even more wonderful because we sat outside with the locals next to the Mekong while cooking and eating it. Dim Tum – boiling pot and fish, raw beef, egg, and veggies. 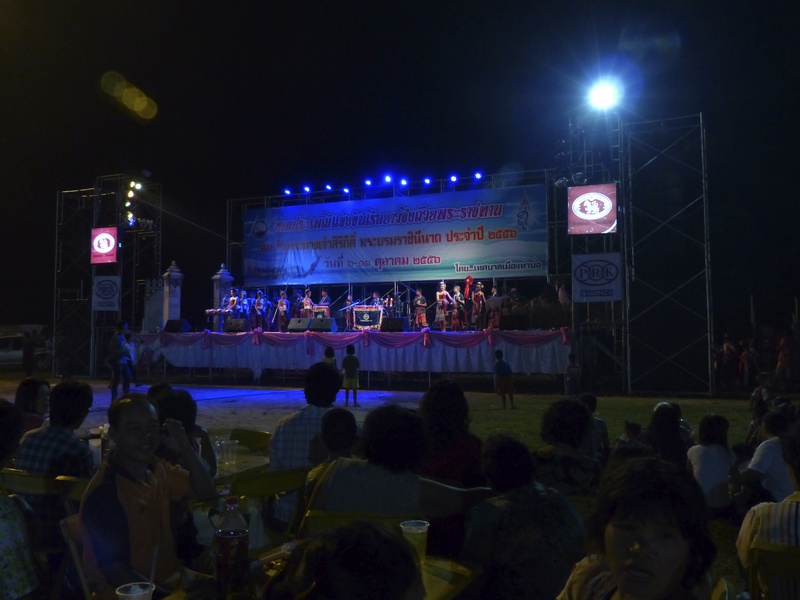 We were fortunate to have arrived in Tha Bo during a town celebration. There was a large fair with rides and food. Everyone was there. 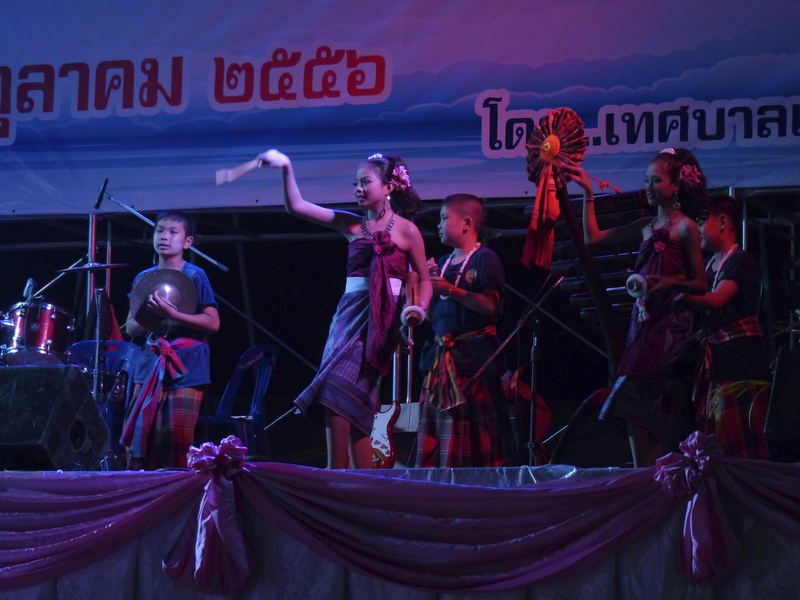 The children performed music and dance as we all looked on. A truly amazing experience. We would have stayed longer in Tha Bo but our Visa was one day away from expiring. We packed up and rode the bus over to Laos with a little regret but completely satisfied with our escape to Tha Bo. Sounds like a beautiful place you found and how wonderful that is was off the tourist path. I hope you can plan to go back there for a longer stay. What a wonderful adventure although I could do without the wooden floor giving way in the old hotel. The food looks so delicious. And the fair so interesting. Have a great time! Love you! I am simply floored. This is an adventure story. My full admiration to you two. Keep it up, I am on pins and needles waiting for the next chapter. Your guesthouse in Tha Bo looks great, is it possible to give me the name of this place? I’ m in Nong Khai on the way to Tha Bo in the next 2 days. Thanks for reading our blog! We never knew the name but if you are still insterested, it is easy to find. 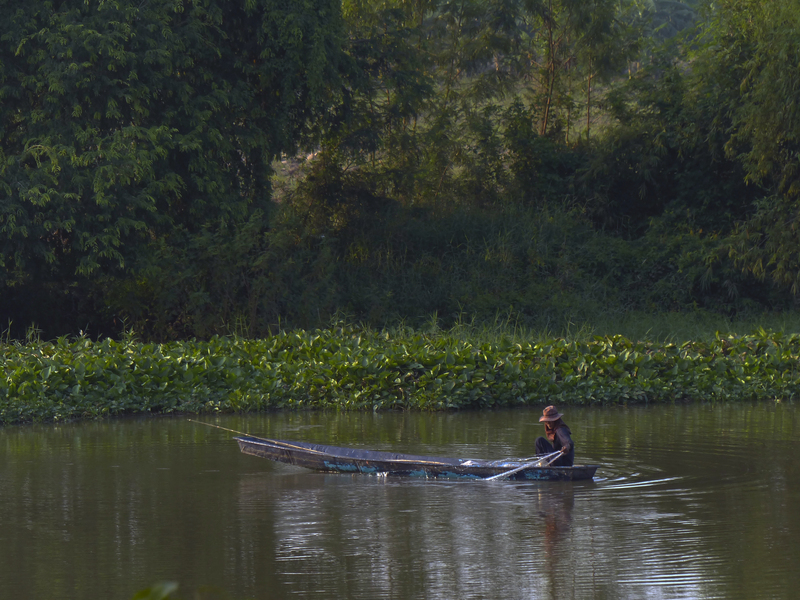 We look the local bus from Nong Khai to Tha Bo and were dropped at the bus station from there we walked the few blocks to the river. I have a map of the location of the hotel and I will email to you…..sorry, I am unable to attached to comments. So please send an email to freebirdtravelblog@gmail.com and I’ll email the map to you. Enjoy Tha Bo!